The highly affordable Sky-Watcher MERCURY-607 allows the younger user to take their first steps into the fascinating world of astronomy. 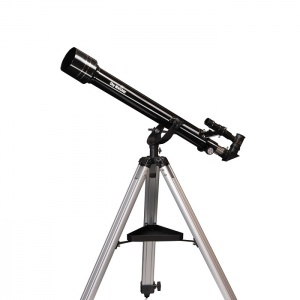 Although similar to many other beginner's refractor telescopes on the market, the Mercury-607 is supplied with superior 1.25" eyepieces and accessories (not 0.96" or hybrid 1.25") and moreover, the eyepieces have been specially selected to give a much more useful and practical range of magnifications (which are not unrealistically too high!) to enhance your viewing experience. The telescope can be freely moved in both horizontal and vertical axes and is equipped with a micro-adjustment elevation control. Suitable to view the Moon, stars and bright planets as well as for daytime terrestrial observations.